Turn of the Century Bed and Breakfast was originally built in 1905 as a private residence. The Heilig-Dees home was then one of the finest examples of late Victorian architecture in the West Square National Register Historic district, here in Salisbury, North Carolina. The home was purchased in December of 1997 by Karen Windate of Atlanta and underwent a painstaking two-year historic restoration. 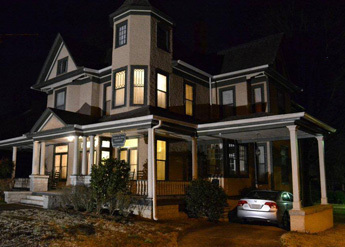 This is the second home that Karen has lovingly restored to its original splendor, the first being an 1890's Victorian in the National Register Historic District, located in Madison, Georgia. The current restoration of the Heilig-Dees home has won critical praise by historic preservation community, the city of Salisbury, and, of course, our many pampered guests. In January of 2000, the Salisbury Community Appearance Commission recognized Karen for her contributions to the city by honoring Turn of the Century with the 1998-99 Building Restoration Award. The past is waiting around every corner as you walk through our historic neighborhoods. You might choose to stop and visit the Rowan Public Library, with its renowned genealogy collections, or to explore Hall House or the National Cemetery. All guests are given a house key in addition to their bedroom key, so you are welcome to come and go as you please! Just a short distance from Salisbury, you can enjoy the North Carolina State Transportation Museum at Historic Spencer Shops, beautiful parks and recreation areas, and even some more modern activities like visiting the High Point Furniture Market or Lowe's Motor Speedway.